Inflation based on monthly Wholesale Price Index (WPI) rose to six-month high of 3.59 per cent in October as compared to 2.60 per cent for the previous month and 1.27 per cent during the corresponding month of the previous year. Inflation based on the monthly Wholesale Price Index (WPI) rose to six-month high of 3.59 per cent in October as compared to 2.6 per cent for in September and 1.27 per cent during the corresponding month of the previous year. The government data released on Tuesday showed that inflation in food items more than doubled to 4.30 per cent in October. For vegetables, it soared to 36.61 per cent last month as against 15.48 per cent in September. On Monday, the retail inflation rose up to seven-month high to 3.58 in October due to the high prices of food items, especially vegetables, eggs, milk and their products, and tobacco products and housing sector. The Central Statistics Office (CSO) and the Ministry of Statistics and Programme Implementation, in a latest report, said the Consumer Price Index (CPI) based inflation was 3.28 per cent in September, 4.2 per cent in October last year. The previous high was 3.89 per cent in March this year. In case of onions, WPI inflation skyrocketed to 127.04 per cent, while for the eggs, meat and fish segment the rate of price rise was 5.76 per cent. Inflation in manufactured products saw a slight dip to 2.62 per cent, as against 2.72 per cent in September. In the fuel and power segment, inflation rose to 10.52 per cent, as against 9.01 per cent in September. Fuel inflation has remained high for the past three months as petrol and diesel prices continued to rule high tracking global crude oil rates. Power tariffs shot through the roof on lower domestic production. Pulses continued to witness deflation at 31.05 per cent. Likewise, in potato deflation was at 44.29 per cent and wheat at 1.99 per cent. The final print of August WPI inflation remained unchanged at 3.24 per cent. 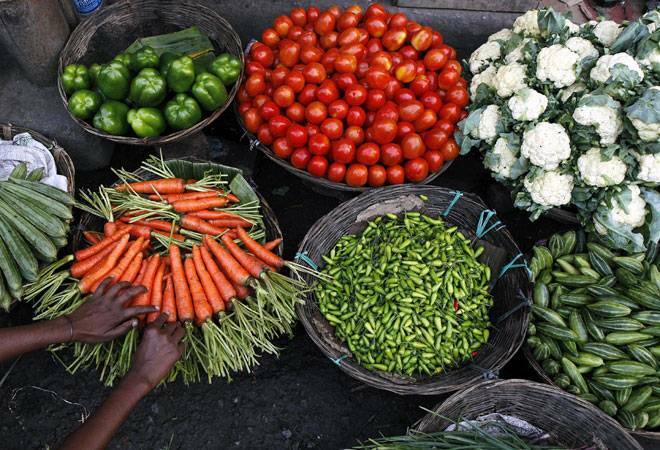 As per the Consumer Price Index (CPI) data released yesterday, retail inflation for October rose to a 7-month high of 3.58 per cent on costlier food items, especially vegetables. Besides, industrial production for September expanded at 3.8 per cent, on poor showing by the manufacturing sector coupled with decline in consumer durables output. Last month, the Reserve Bank kept benchmark interest rate unchanged on fears of rising inflation while lowering growth forecast to 6.7 per cent for the current fiscal. RBI also raised its inflation forecast to the 4.2-4.6 per cent range for the rest of the current fiscal as against 4-4.5 per cent previously. The CSO data says the October inflation for the food basket increased to 1.9 per cent. It was 1.25 per cent in September. The rate of price rise in the vegetable segment almost doubled to 7.47 per cent as against 3.92 per cent in September.